BETHESDA, MD, 2018-Sep-05 — /Travel PR News/ — Ian Schrager’s rising global influence lands in Spain with the arrival of his newest venture in the growing EDITION empire: The Barcelona EDITION. Regarded as the avant-garde capital of Spain, Barcelona is the natural destination for EDITION’s latest hotel to set a pioneering cultural precedent in modern luxury travel, forming a vibrant new landmark for the self-confident city. The Barcelona EDITION is the true personification of an urban resort: an intimate and sophisticated boutique-style environment, yet at the same time, a destination in itself for the city’s best entertainment, food and drink. Not only famed for its creative spirit and energy, Barcelona is the first city in the world to gain UNESCO Biosphere accreditation as a sustainable tourist destination. With EDITION’s Stay Plastic Free initiative to inspire and influence other hotels, brands and properties to ban the use of single-use plastic, The Barcelona EDITION will act as a thought leader and innovator in the cities sustainable tourism action, promoting a new kind of travel that shares environmental responsibility between visitors and residents alike. The Barcelona EDITION will boast an enviable locale in El Born, the city’s creative hub in the centre of the famed Ciutat Vella district. Translating as ‘Old City’, the hotel is situated in the most historic district of the city, positively vibrating with life, style and energy. Nestled between the cerulean waters of the Mediterranean Sea and l’Eixample neighbourhood – Barcelona’s renowned boutique shopping epicentre – the location is considered the beating heart of the city, now only made stronger with the energetic influence of The Barcelona EDITION. Adjacent to the iconic Santa Caterina Market and within fifteen minutes of the beach and the great Barcelona Cruise Port, the hotel is set within walking distance of the city’s most beloved landmarks including the Picasso museum, Antoni Gaudí’s Palau Güell, and the famed Basilica de Santa Maria del Mar. As with each of its predecessors, The Barcelona EDITION has all the trademarks of the EDITION brand: lasting comfort, extraordinary style and an exceptional level of service in a uniquely individual environment. Under the creative direction of Ian Schrager, alongside the famed Spanish interior designer Lázaro Rosa-Violán the hotel brings together, in a subtle synergy, the integrity and character of a historic environment with a simple, sophisticated design sensibility, creating a seamless blend of charisma and ease. With 100 rooms and suites, three restaurants, two bars, a roof terrace with plunge pool and a buzzing lobby, the hotel offers a dynamic social hub where guests and visitors can work, relax, socialise and dine all under one roof. The Barcelona EDITION is a new kind of gathering place unlike anything that the city has experienced before. It is a testament to the modern lifestyle, welcoming a new generation of travellers that are more connected than ever and are hungry for community and social interaction in the physical world, not just online. They seek to surround themselves with likeminded individuals with common interests, views, aesthetics, tastes and desires. The hotel’s public spaces will be activated day and night, starting with the lobby which has been taken by Schrager and evolved into the centre of The Barcelona EDITION’s social activity, dedicated as much to work as it is to play. First impressions are the ones that last, which is why upon entering through the main doors, guests experience being greeted by a spectacular double-height lobby space dominated by a striking, sapphire blue Eric Schmitt chandelier and a selection of timeless furniture pieces originally designed by Catalan masters, Salvador Dalí and Antoni Gaudí. To the right of the impressive entrance, a black marble and walnut wood reception desk reminiscent of an abstract sculpture piece dominates the reception and concierge area. To the left, an eclectic and sophisticated lobby lounge area invites guests to enjoy a more laid-back ambience set against the backdrop of the dynamic bar-restaurant. Composed of two generous spaces, the lobby lounge boasts a rich selection of furniture pieces with greatly varying styles. The first of the two spaces, aims to give the impression of a more traditional living room ambience with four Christian Liaigre chairs and a games table in the centre, as well as a pair of iconic Yves Klein blue armchairs designed by Gerrit Thomas Rietveld. The second space has been conceived as a more intimate lounge area with low ceilings and large sheepskin armchairs. An iconic illuminated blue art piece by Carlos Coronas is framed by the space to the rear and combines elegantly with dark wood wall finishes and off white fabrics. True to the EDITION vernacular, a spectacular lobby bar serving locally produced vermouth, craft beer and sherry will act to unite the hotel’s reception with an informal all-day dining restaurant overseen, alongside the hotel’s two further dining concepts, by partner chef and founder of the global movement ‘Cooking in Motion’, Sebastián Mazzola, formerly creative director of the Adrià Group, developing the concepts behind the city’s famed Tickets and Pakta. Seating 87 guests, Bar Veraz offers a menu of affordable dishes that focus on the freshest, seasonal ingredients to attract not only residents, but locals alike. In the mornings the space offers guests a light and airy a la carte breakfast experience. For lunch and dinner, the menu features a cutting-edge interpretation of Mediterranean specialties complemented by a regionally focused wine list including more than 30 wines from local vineyards. Connecting to the lobby and boasting its own separate entrance to the corner of the building which overlooks the iconic Santa Caterina Market, Bar Veraz’s guests and visitors alike are captivated by an enormous central bar piece that occupies the double height space. Hanging from the high ceilings above the bar, this awe-inspiring aged brass element glows elegantly. The wall of backlit liquor bottles creates a warm crepuscular light reminiscent of a Mediterranean sunset. A selection of original art pieces by 4 famous Catalan artists Joana Biarnes, Colita, Xavier Miserachs and Oriol Maspons accompany the seating arrangements, helping to forge a strong connection between the city, culture and fine dining. 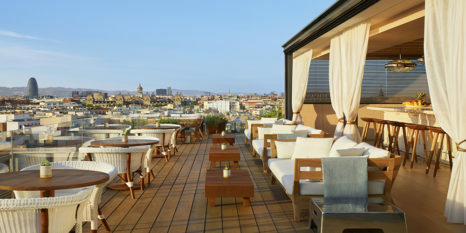 A protected island of terrace seating at the front of the hotel offers guests an al fresco dining experience, looking out over the Santa Caterina Market and perfect for observing local life along this busy Barcelona thoroughfare. A fresh incarnation of The London EDITION’s award-winning Punch Room will occupy the mezzanine floor, adapted seamlessly to suit the Barcelona zeitgeist. Accessed by a feature spiral staircase of steel, marble and wood, this sophisticated space overlooks the main lobby and dining area and offers an extensive menu of long drinks, punches and sangrias served from vintage silver bowls as well as a highly curated menu of individual cocktails alongside a selection light bites to complement the drinks offering. For those with a sporting streak, an impressive Castilian style billiard table with golden cloth welcomes guests into a space enclosed by elegant oak panelled walls which are complimented by a rich dark oak checkerboard floor. A black granite fireplace, combined with sophisticated leather and green velvet furniture pieces adds further to the warmth of the space, whilst a collection of photos by local artist Andrea Torres are framed along the walls, flanked by elegant wall sconces and antique free-standing lamps. Clandestinely hidden in the basement floor of the hotel sits a new world altogether. Cabaret offers a new kind of dining concept, never seen before in Barcelona. Conceived with late-night revelry in mind with its low lighting and sumptuous materials, Cabaret is a restaurant for the darker hours with a sultry lounge area, cocktail bar and superior food experience based around a tasting menu concept. As guests come to the end of their main courses, the long, velvet curtains at the far end of the dining room will be drawn back to reveal the stage, dramatically framed by a large archway and ready to expose the night’s entertainment, from the hottest DJs and internationally renowned performers, playing out into the early hours of the morning. An impressive cocktail bar sits at one end of the space whilst the lounge area, with its low ceiling and black velvet walls glimmer in the low light and set the scene for a more intimate ambience away from the main club area, fated to become a cult venue in Barcelona’s ever-growing nightlife scene. Destined to be the most desired of Barcelona’s daytime social gathering places, The Roof, located on the 10th floor of The Barcelona EDITION, offers an unparalleled panoramic view over the city and offers food and drinks served all day to residents and visitors alike. The kitchen offers small plates of light, flavourful Latin-American dishes with an Asian influence, designed to be shared and enjoyed amongst friends and families. The abundantly-planted lounge area, with colourful Bougainvillea and a profusion of plants, flowers and greenery giving the ambience of a garden in the sky. An Iroko wood decking spans across the terrace, further adding to the sensation of a private garden, equipped with lanterns and upholstered furniture in ivory, grey and blue tones. The travertine marble-fronted cocktail bar offers an innovative seasonal drinks menu as well as healthy juices and smoothies, surrounded by lounge seating and sunbeds situated around the unique plunge pool. For the cooler days and evenings, service continues come rain or shine as the glass sliding walls come to a close to offer guests one of the only year-round rooftops in Barcelona. Settled in between the public areas on the first floor and The Roof lies the 100 rooms and suites, each with their own faultless city views over Barcelona’s Gothic Quarter, Santa Caterina Market and the district of El Born. Bringing modern luxury to a new era, each room features the conveniences travellers and pleasure seekers have come to expect and rely on, as well as indulgent amenities waiting to be discovered. State-of-the-art beds are adorned with EDITION’s Signature imported luxury Anichini linens and unique, custom designed furniture with carefully selected fabrics such as the embossed Spanish leather headboards give a warm and sophisticated touch to each room. The windows, all of which give breathtaking views of Barcelona’s skyline, add to the feeling of insulated calm within the rooms. The walls of the bedrooms are clad in walnut panelling, evocative of the shutters that dominate the old town’s narrow street facades and floors feature a fresh whitened oak herringbone parquet. Bathrooms are finished in white Sivec marble, detailed with contrasting brass hardware, for a modern bathing experience with custom-scented Le Labo amenities as standard. Two stunning penthouses set the standard for luxury in Barcelona, each a home-from-home concept with their own private terraces equipped with laid-back lounge areas and dining furniture for private al-fresco meals and relaxation under the Catalan sun. The gym, meanwhile, on level one, does away with the crowded standard of contemporary gyms, and combines wellness and holistic design into the need for physical exertion, open 24 hours. The state-of-the-art gym equipment selected with no expenses spared by renowned fitness experts, are installed on a smoked oak skin that lines the floor and walls. The gym studio gives onto a wellness and meditation space where guests can rest and practice tai chi, yoga, and cardio against an urban backdrop. In short, The Barcelona EDITION will deliver an innovative travel experience in Barcelona, bringing the new generation of luxury and lifestyle to the city centre with a strong focus on sustainability. It will commit to provide an unforgettable experience with genuine, personal, uncomplicated levels of service delivered by the most talented and impassioned employees. As with all EDITION hotels, it will offer the perfect marriage between accommodation, food, drinks, entertainment and design for visitors and locals alike. Reservations are now open with opening rates starting from €375 per night, including breakfast*. *Rates are subject to availability, based on two people sharing one double room. EDITION Hotels is an unexpected and refreshing collection of individualized, customized, one-of-a-kind hotels which redefines the codes of traditional luxury. Displaying the best of dining and entertainment, services and amenities “all under one roof’, each EDITION property is completely unique, reflecting the best of the cultural and social milieu of its location and of the time. Conceived by Ian Schrager in a partnership with Marriott International, EDITION combines the personal, intimate, individualized experience that Ian Schrager is known for, with the global reach, operational expertise and scale of Marriott. The authenticity and originality that Ian Schrager brings to this brand coupled with the global reach of Marriott International results in a truly distinct product sets itself apart from anything else currently in the marketplace. Each hotel with its rare individuality, authenticity, originality, and unique ethos reflects the best of the cultural and social milieu of its location and of the time. Although all the hotels look completely different from each other, the brand’s unifying aesthetic is in its approach and attitude to the modern lifestyle rather than its appearance. EDITION is about an attitude and the way it makes you feel rather than the way it looks. Sophisticated public spaces, finishes, design and details serve the experience, not drive it. For an underserved market of affluent, culturally savvy and service-savvy guests, the EDITION experience and lifestyle explores the unprecedented INTERSECTION and the perfect BALANCE between taste-making design and innovation and consistent, excellent service on a global scale. Currently operating hotels in New York, London, Miami Beach, Sanya, China and Bodrum, Turkey. Future hotels are underway in Shanghai, Abu Dhabi, Times Square, New York and West Hollywood. This entry was posted in Hotels, Luxury, Resorts, Travel, Travelers and tagged Barcelona, EDITION hotels, Marriott International, Spain. Bookmark the permalink.